This summer we plan on throwing some epic cookouts and parties. 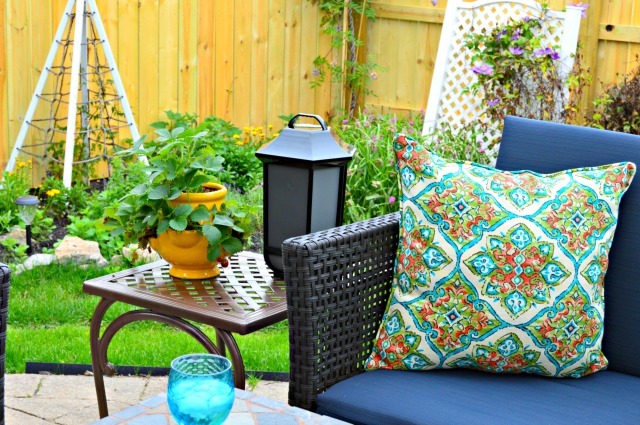 I teamed up with my friends from Wayfair to makeover our patio and turn it into a shaded summer patio just in time to put together an amazing party plan for this coming Father’s Day. This post is sponsored by Wayfair. All ideas, photos and of course all opinions are 100% mine…always will be! Let me give you a little backstory on our patio. 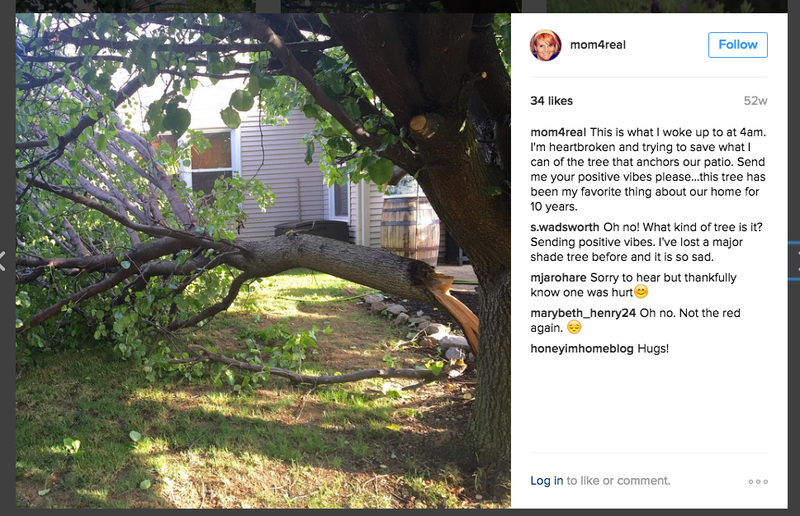 We used to have a huge tree that anchored our patio. It was my favorite thing about our home. It was my tree of life so to speak. Every spring when it started to bud and bloom, I would get so excited. It blocked out all of our neighbors, provided the perfect amount of shade and was just beautiful. Midsummer last year, my tree started to break into pieces. There was a lot of crying on my part, some talk of trying to save the tree, and eventually, removal of my tree. It was heartbreaking. We would come out on our patio after the tree was removed and head right back inside. Our patio just wasn’t the same. I started making plans to revamp and totally redo our patio this year, and I can honestly say that I couldn’t be happier! 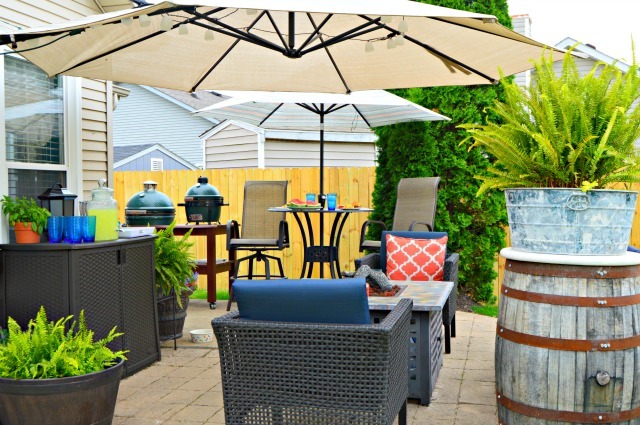 I teamed up with Wayfair to find some solutions to our non-shade issue and now our yard feels bigger, our patio is still shaded and we can barely make ourselves go inside. We are making big plans for Father’s Day this year and also a graduation celebration this weekend. Our son Cam is graduating from high school today, so we will be hosting friends and family for a party this weekend and then in a few weeks we will be celebrating Father’s Day. Shew…time is flying so fast! We really like to treat our patio like an extension of our home and make if feel like another room…with better views. So, on the shade issue. 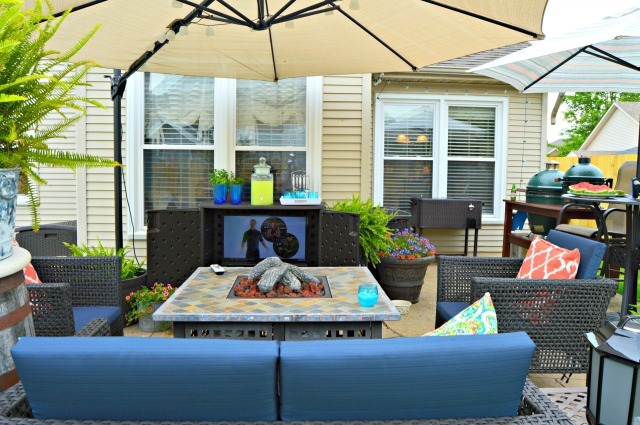 We found the answer to our prayers in this 12 foot Cantilever Patio Umbrella from Wayfair! It is seriously amazing! It can tilt, turn and covers our seating area perfectly. It can tilt almost all the way back and act as a wall too, so if the sun moves, we just move it along with it. Isn’t this a cozy set up? We really wanted a sitting area that felt like a living room area, complete with a fireplace and drinks close at hand. 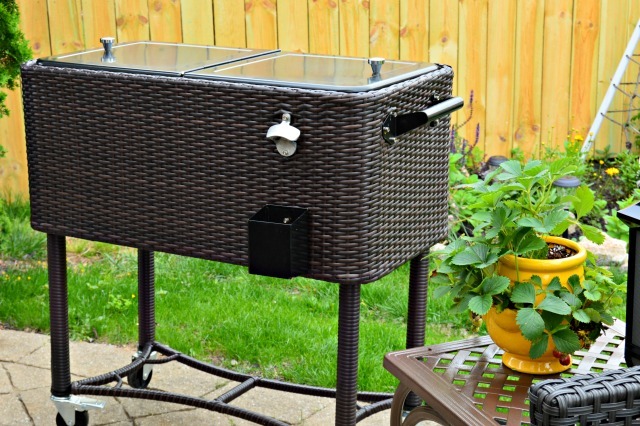 The wicker rolling patio cooler with bottle opener and catcher is perfect for all of our drinks, and has a drain in the back to get rid of melted ice. 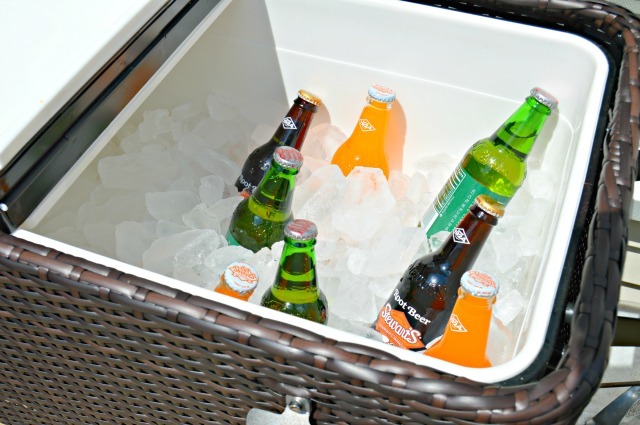 When we have cookouts, we just fill it up with ice and our favorite drinks so our guests don’t have to go in and out to grab their favorite drinks. 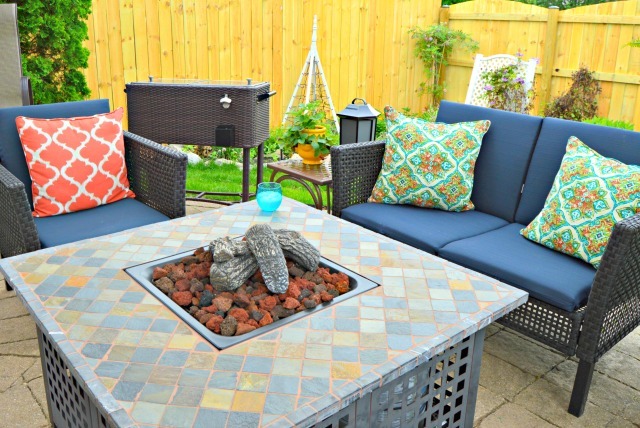 I can also move it around to different parts of our patio, depending on where we will be spending our time. 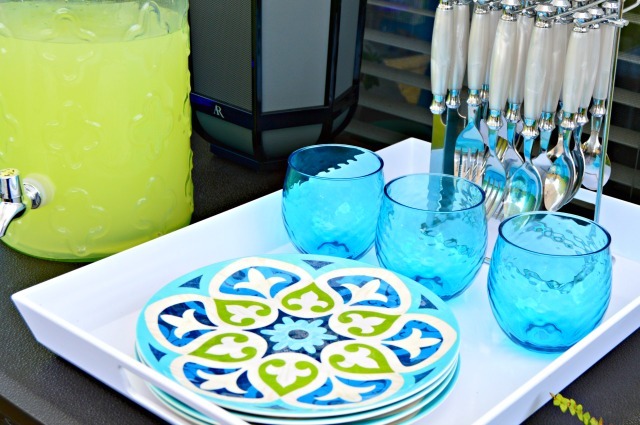 I fell in love with the Barcelona Plates and Granada Plastic Wine Glasses. I love the colors and that they are practically unbreakable. No worries about dropping them or being super careful, and again…super cute! We planted lots of containers to tuck around the patio, like these strawberries in the cutest Strawberry Pots ever. Speakers are a must too…you have music when you are hanging outside, am I right? Bring on the Jimmy Buffet! 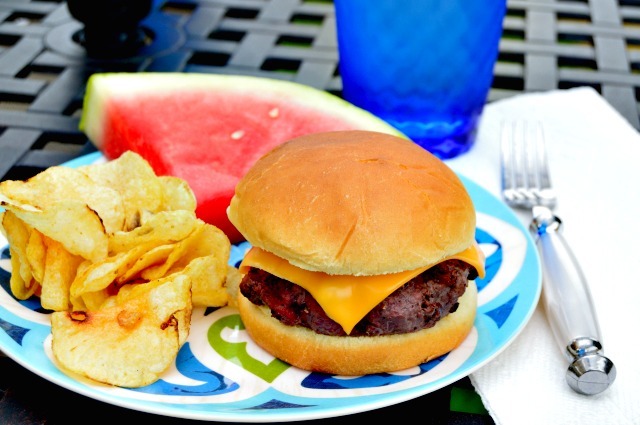 We are going to be keeping the menu pretty simple for Father’s Day…it’s all about the burgers, watermelon and chips, which are Matt’s favorites! For Cam’s graduation party, we will be smoking pork shoulders and having a true BBQ. Well, we also had to add a television…because sports y’all. Matt takes his sports pretty serious, so we added a cabinet to house a television, and our umbrella shades it perfectly so there isn’t any glare. This is where you will find our family this summer, eating watermelon, sipping drinks and watching baseball, golf and maybe even watching a few movies late into the night. If you are ever in the neighborhood, just drop on by…you know where you’ll find us! 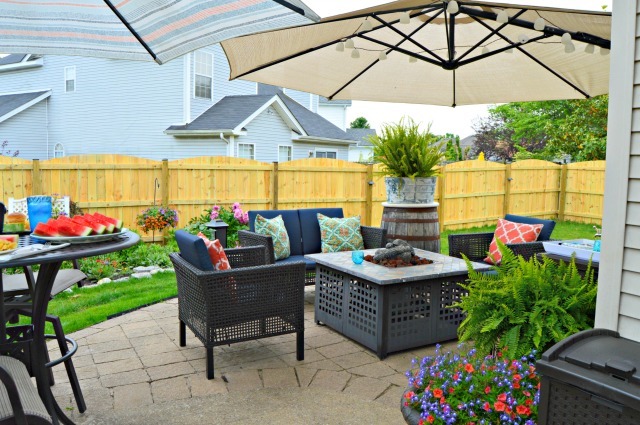 Your outdoor room is fabulous! The color scheme is perfect for summer, spring & fall. I just finish my patio make over and used the light blue too. Now I just need to get the umbrellas. Thanks for the ideas. Great re-do! I understand about the tree! Where did the flatware hanging beside the melamine plates come from? . Wayfair as well? LOVELY! Does the tv LIVE out there all summer? Is that cabinet weather-proof? Would like to do something similar. Great job creating this space. And the watermelon looks cold and delicious (smile) Will have to check out Wayfair.. thanks for sharing. Where did you get the outdoor storage for the tv?